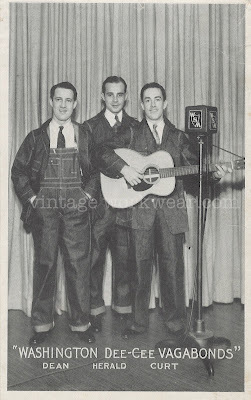 vintage workwear: The "WASHINGTON DEE-CEE VAGABONDS"
Dean, Herald and Curt aka the "Washington Dee-Cee Vagabonds" seen sporting their alternative to the "Texas Tuxedo", likely circa 1930-1940. The microphone on the right belonged to WSM, the AM radio station best known as the home of The Grand Ole Opry, the world's longest running radio program. Just about the best denim "suits" since Bing Crosby donned his LEVIS Tuxedo back in 1951.